Unlike Electro-mechanical engraving which produces a conventional cell shape, Laser engraving offers immense flexibility towards altering cell shapes and structures for the rotogravure cylinders. This is the fundamental reason that results in low ink GSM while printing on the substrate. To understand this point better, it is rather important to have a quick recapitulation about the roll the typical cells of a rotogravure cylinder play during the printing process: The ink is picked up by the cylinder and transferred on to the substrate. The rotogravure cylinder is immersed in the ink sump and during the process of printing the recessed (engraved) cells pick up the ink. The substrate gets sandwiched between the impression roller and the gravure cylinder. At this juncture the ink gets transferred from recessed cells to the substrate by capillary action. Explaining the recent break-through of lesser ink consumption in rotogravure printing, Mr. P.K. Agarwal, Joint President, Cylinders Business, Uflex Limited said, “On the laser engraving set-up, our team has been able to create various modifications on honeycomb cell structure, line cell structure, TB cell structure and others which in turn during the print run render solid backgrounds, coating with high & low depths, other specialized coatings, vignettes, half tone images among several others. Mr. Agarwal continues, “It is all about the shape and structures of the cells that we have been able to modify and optimize through the process of laser engraving. This is not possible in electro-mechanical engraving which can only produce conventional cell shape/structure. From the cross-sectional images one can clearly understand that the volume of ink entrapped in the conventional cell structure achieved through electro-mechanical engraving is much more than that in the modified/optimized cell structure achieved by laser engraving. Further, the face opening of the laser engraved cell structure is much more than the conventional cell structure hence less volume of ink is transferred on larger area of substrate. So, effectively you get more print coverage with lesser amount of ink by laser engraved cylinder having modified/optimized cell shape/structure. We carried out a comparison test under Standard Operating Conditions (for the same printing job) with White Solvent Ink (for continuous tone) using an electro-mechanically engraved rotogravure cylinder having conventional cell shape/structure and a laser engraved cylinder having modified/ optimized cell structure. The viscosity of ink used was 14 Saybolt Seconds in both the cases. The results in terms of ink saving have been extremely impressive. The ink consumption in the second case was almost 22.5% less than that in the electro-mechanically engraved cylinder having conventional cell shape/structure. This is quite a feat in terms of savings towards the running costs incurred by a convertor of flexible packaging”, concluded Mr. P.K. Agarwal. Better printability i.e. exact dot gain is achieved. Uflex is India’s largest multinational flexible packaging materials and Solution Company and an emerging global player. Since its inception back in 1985, Uflex has grown from strength to strength to evolve as a truly Indian Multinational with consumers spread across the world. 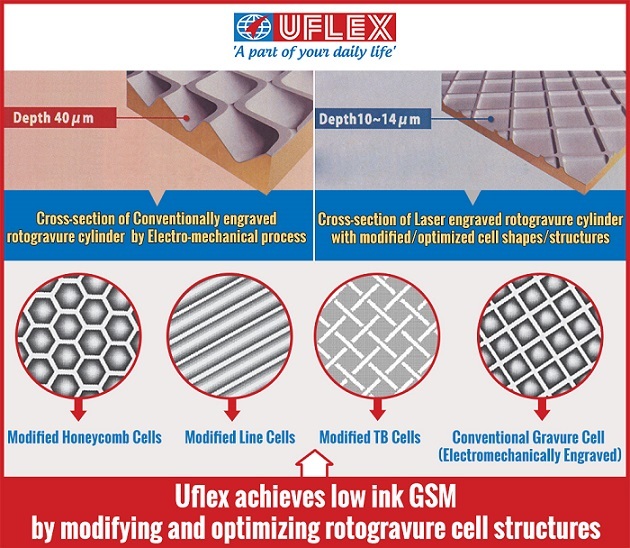 Uflex today has state-of-the-art packaging facilities at multiple locations in India with installed capacity of around 100,000 TPA and has packaging film manufacturing facilities in India, UAE, Mexico Egypt, Poland and USA with cumulative installed capacity in excess of 337,000 TPA.